It’s been suggested that Crowbar is living in the shadow of Savio Volpe’s voluminous, silky tail across the street, but Crowbar’s plenty strong enough on its own to be a Plan A rather than Plan B. Yes, this space used to be Mega iLL Pizza, which I never got around to trying even though initially they used Oyama sausage in their pizza. Ironically, I was always too couch-locked to go check it out. Let’s be clear, the menu here has been chef* Justin Ell’s creation for about the past year, so anything you might’ve read from the first few months of Crowbar’s existence no longer applies. This is all Justin’s food now, and it’s an ever-evolving menu with elements that get tweaked and changed nightly according to the chef‘s whimsy. In fact, the “Dealers Choice Pasta” follows no set routine at all, and will change subtly or drastically from plate-to-plate in the same evening. You have to forgo any sense of soulless chain restaurant consistency and surrender yourself to the experience. * The chef hates being called “chef”. Too humble, I think 😉 He’s running the kitchen all by himself, has a sense of adventure and experimentation, is cooking food that he wants to eat, has a lot of knowledge that he quietly keeps tucked away…I think most real chefs would kill to be in his position. Menu is available online but not always up-to-date. There’s a good range of small-to-larger plates, all shareable without too much trouble. During their happy hour, certain items on their regular food menu will be 50% off. On this visit, the Organic House Bread and Roast Brussels Sprouts were 50% off. That works out to $4 for a generous plate of fantastically cooked brussels sprouts. Killer. Yeah, they could include a couple more plates on their happy hour, but in general this place appeals more to good food hunters rather than deal hunters. Note: read the disclaimer at the bottom of the menu. Then read it again. And take it to heart. Only three taps, all Parallel 49. But for a small place that seats less than ~30 people, it’s fine. If I wanted more beer, there’s always Bells & Whistles around the corner. Bottle list. There’s also a large cocktail & wine list here. They’re only open 5:00pm to midnight, so I don’t imagine you’ll be camping out here with your laptop but it’s good to have power readily available. The small kitchen at the back, the bar on the right. I’m sitting at the banquette along the entire left wall of the space. We chose olive oil. They serve Domenica Fiore Reserva, which is robust and flavourful. It’s kind of a treat to have such a good olive oil. The bread itself caught me off-guard. It had a thick, caramelized crust and a very rough ‘n rustic appearance. The crumb was soft, moist, chewy, and had the most acidic sourdough taste I’ve ever had. Very tangy, with a deep, sweet, complex flavour. It’s like eating a crazy experiment that went so wrong it became so right. Very unlike any sourdough I’ve tried in the city. Not like Fife, not like Nelson, not like Batard, maybe a bit like Beyond Bread in the way that they like to push the baking until the loaves get really dark…but tastewise it’s entirely unique to this place and this chef. And knowing how the food goes here, the taste of this bread will change from batch-to-batch, week-to-week. I can’t wait to be surprised again. Grilled Marinated Chicken Hearts ($12) with mushrooms, breadcrumbs, and parsley. A bit of a soy sauce flavour in this one, plus a bit of acidity, so it reminded hungrySLIF of Filipino flavours! The hearts were cooked to a plump ‘n juicy medium. I didn’t check the inside to make sure, but from the way they popped inside the mouth was wonderful. Some people might not dig hearts cooked like this (I’ve also had chicken hearts cooked medium at Zakkushi), but I like it a lot. Might seem like a simple, basic dish but it just plain tasted good and shows that they know flavours and are actually tasting the food. Roast Brussels Spouts ($8, was $4 during this happy hour) with tonnato (tuna mayo) and grated piave on top. Love the colour on the brussels sprouts. But that tonnato! Very tasty. I don’t eat as much Italian food as I’d like, but the tonnato reminded me of the versions of bagna cauda that I’ve had. Simply great flavour and execution. Char Siu Pork Cheeks ($16) with grilled bok choy and crushed almonds. Bok choy was grilled to a sweet soft state, had a beautiful smoky char, but still had some texture. The pork cheeks were super tender. Flavouring wasn’t quite what I know as Chinese char siu, but was still good for what it was. While technically good with no faults that I could see, the dish as a whole didn’t thrill as much as the previous two — which might just be us and our particular food histories. Cheese Burger ($18) with in-house dry aged beef, taleggio cheese, and challah bun with fried potatoes. It says “fried potatoes”, but WOW, that doesn’t begin to explain the glory of these potatoes. Coated with dehydrated tomato powder, these crunchy potatoes pushed spots marked “G” and “P”. The tangy umami reminded me of ketchup flavoured chips and crunchy Shake ‘n Bake seasoning. It’s all the MSG-laden flavours you love, but without actual MSG (that I know of). Warning: by the time you check this place out, these potatoes may indeed be a different take on fried/smashed potatoes. Similar to how the house bread caught me off-guard, this Cheese Burger startled me with it’s 60+ day funky dry aged flavour. AFAIK the meat is dry aged in-house and the age varies. During this visit the meat was at 64 days IIRC. A completely different beast from the Upstairs at Campagnolo Dirty Burger, they’re not even competing on the same plane of existence. 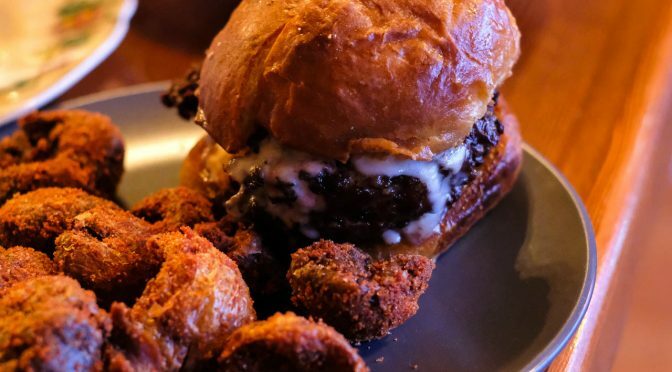 Both burgers deserve a spot in your dry aged beef burger consumption itinerary. I love how THICK the patty is. And it’s medium-rare! (Or rare, depending on your interpretation.) The coarse grind took me a couple bites to appreciate. Initially off-putting because I’m used to a finer grind, but by the end of the burger I had to redefine what I knew and loved about burgers. The mayo contained BEEF FAT(!) and red wine vinegar and added a pickly tang to the affair. The bun is soft, a bit sweet, and doesn’t detract from the meat. This is a brutal, purist burger. It’s just meat, cheese, bun, and a bit of mayo. I want it again. Dealers Choice Pasta ($17). As I said earlier, the pastas at Crowbar are spontaneously created using whatever is seasonal and on-hand in the kitchen, and can change from order to order. Tonight we got an egg noodle pasta with preserved sungold tomatoes, beef tripe, crispy breadcrumbs, and (I think) ground beef. Tender, silky egg noodles. Tender little chunks of tripe. Flavourful and balanced but could’ve used something to perk it up. We sneakily poured on some of that delectable olive oil left over from the bread, and that took it to the next level. I’d love to see what the chef can do with regular pasta. We split the bill in half, so the total shows my portion for all of the above food. Quite reasonable. This feels like the perfect time to check out Crowbar. The ever-changing nature of the menu, the growing reputation of Fraserhood being the next hot food area, it all seems to be creating this perfect moment for Crowbar. I don’t know how long this moment will last, so enjoy it now. Expect busy weekends, so try to go early-to-mid-week. Bring an open mind — or an open heart and empty stomach (Iron Chef reference). Nice! I’ve been wondering about that place and yeah, the staff thing was kind of off-putting. You make me want to go now. Thanks. Wonder what a face-off between Crowbar and Bells and Whistles will look like and if they are suffering with the big response to B & W.
I would only do 4, maybe 6 max. I think they can push tables together to accommodate.